No matter your political persuasion, this story should get your blood boiling (and your hand reaching for your telephone to call your Congressman) over this outrageous dirty energy corporate welfare. There's so much disinformation spewed out there by the fossil fuel industry against clean energy, it's hard to debunk it all, let alone in a timely fashion. That's why it's so helpful to have sites like the American Wind Energy Association's (AWEA) "Into the Wind" blog, where they set the record straight about various lies put out their by big oil, coal, etc. For instance, "One of the common myths deployed by opponents of clean energy is that wind energy’s environmental benefits are significantly reduced by the energy and carbon expended on manufacturing and installing wind turbines." AWEA promptly demolishes that one. Speaking of the surge in interest among investors for clean energy we wrote about yesterday, Eric Wesoff of Greentech Media has another example of what we're talking about. October is one of the busiest times of the year at Tigercomm. No, it’s not because we love Halloween (which we do) or because we’re engrossed in baseball’s postseason (which we are – Go Sox!). It’s because we’re prepping for Solar Power International! Wall Street Journal: "Mississippi Plant Shows the Cost of 'Clean Coal'"
As much as the coal industry likes to pretend that there's such a thing as "clean coal," it simply isn't true. From the process of mining the coal to its transportation and combustion, not a thing about it is "clean." Not the least of coal's problems is that it's the most carbon-intensive fossil fuel. One possible solution to that problem involves capturing and "sequestring" the carbon (the process is called "Carbon Capture and Sequestration," or CCS). The problem is, CCS is extremely expensive, to the point that if it were required, it would likely render coal uncompetitive with other energy sources - natural gas, wind, solar, etc. And that cost problem doesn't seem to be going away anytime soon. 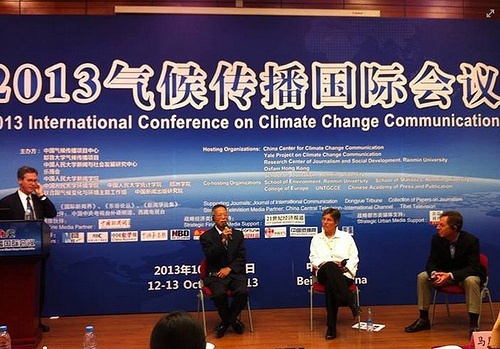 The Yale Project on Climate Change Communication (YPCCC) is currently holding its Inaugural International Conference on Climate Change Communication in Beijing, China. Here's an update from earlier today from the YPCCC's Facebook page. This video, appropriately titled "Last Hours", makes a powerful case that climate change is an existential threat to our planet, and that we need to get off of fossil fuels ASAP. What to replace those fossil fuels with is clear: energy efficiency, wind and solar power, geothermal energy, etc. Fortunately, many of these alternatives have seen enormous technological improvements, cost reductions, and economic competitiveness (with costly, polluting, and heavily subsidized fossil fuels) in recent years. Even better, these trends are almost certain to continue. That's crucial, because the faster we switch off of carbon-based energy, the less likely the disaster scenario portrayed in this video will be to take place. Here are five recommended reads for today (10/11/13). On September 16th, I was excited to bring our "Scaling Green on the Scene" interview series to the CleanTech OC 2013 Conference and Expo in Irvine, California. This conference is the "only annual conference in Orange County dedicated to covering the clean technology space and connecting industry stakeholders from throughout the region and state.” In the first installment, we wrote about my interview with former EPA chief Stephen Johnson, in which Johnson talks about the "upcoming, beneficial explosion of cleantech." Here are five recommended reads for today (10/9/13). Video: Former Bush EPA Director Stephen Johnson on the "upcoming, beneficial explosion of cleantech"
On September 16th, I had the opportunity to attend the CleanTech OC 2013 Conference and Expo in Irvine, California. If you haven't heard of it, CleanTech OC is "is a trade association that seeks to promote economic growth in the Orange County clean technology industry, which is likely to be one of the most significant engines for job growth in Southern California over the next decade." As for the CleanTechOC Conference, it is the "only annual conference in Orange County dedicated to covering the clean technology space and connecting industry stakeholders from throughout the region & state." We thought we'd spotlight two encouraging items related to electric vehicles this morning, both from Virginia. Here are five recommended reads for today (10/2/13). Bloomberg New Energy Finance on "Green Shoots of Institutional Investment in Clean Energy"
We received a fascinating email earlier today from Bloomberg New Energy Finance entitled, "Green Shoots of Institutional Investment in Clean Energy." It looked at the "risks, challenges and barriers to increased institutional investment in clean energy," as well as signs that institutional investment in clean energy projects has begun to pick up. Here are a few key points from the email. The other day, we posted a news-making interview between Tigercomm President Mike Casey and former super-lobbyist Jack Abramoff. The bit takeaway from that interview was Abramoff's assertion that clean economy CEOs who think that federal policy is not relevant to their businesses are "living in a dream world." Clearly, the fossil fuel industry does NOT live in a dream world, but instead in the world of political reality, in which spending big money on lobbying, donating to political campaigns, and generally buying influence in the corridors of political power gets you what you want from the government. Today, we have a perfect example of this, with a Politico story about what happened to President Obama's nominee to the Federal Energy Regulatory Commission.